Glistening with 228 Real Crystal Beads this magnificent Prestige Silver Crown is brimming with gorgeous faceted crystals set against superbly shiny silver, creating a centerpiece that grabs attention and stands out like no other accent piece! At 16" tall and 15" wide, this beaded crown joins our premium quality line of Prestige products that grace the venues of top wedding and event planners. The top spire is removable which makes the perfect platform for Flower Balls and the bottom opening is 9 1/4" in diameter, creating a large space for additional decorations. 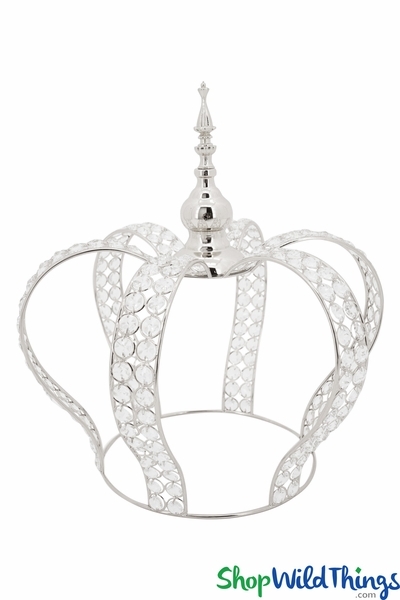 Classy and opulent, this sturdy crown weighs 4 lbs. You will also receive 5 extra crystals and fasteners for...just in case! Our crystal beads are real crystal, not acrylic and they are faceted on all sides. You will find sellers who "sneak" in plastic beads or mix acrylic with glass beads. We are fanatical that this is NOT done on our products so that you experience exceptional clarity and maximum shimmer and shine! Decor you want to show off! 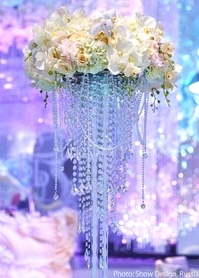 By itself, this crown makes a dessert or gift table stand out and sets the tone for your event. For centerpieces, place the crown on a mirror with Flameless LED Candles and watch the prism of colors dance off the crystals! Hang Crystal Pendants and Ornaments inside the crown for added glitz. Another look is to combine cool to the touch fairy string lights with tulle. To add your event colors, use a Flower Ball to fill the cavity or use this like a vase or riser by removing the spire and placing a flower ball on top of the crown! To choose the proper ball, please see our helpful note at the bottom of this description. For Decor that radiates pizazz and elegance, this Silver Crown sets the standard and there's just something about the majestic look that makes everyone feel a bit more royal. For weddings, events, proms, anniversaries, quinceaneras, birthday parties and Mardi Gras, there are so many ways to integrate this into your event theme! Note on Flower Balls: To top off the crown, remove the spire and we think the bigger the ball the better it looks and if using our extra full, 14" Ball, you really only need 1 half of the entire ball for the top or for the cavity (score!). For filling the cavity, the silk and foam rose balls have a non-flexible Styrofoam center where the silk hydrangeas have a squishable plastic center. Please consider this as well as the size of the crown opening when choosing which ball will fit best. We easily fit a 9 1/2" silk rose ball and carefully fit a 9 1/2" foam rose ball inside this crown.